Wolves are ready to mate at about two years of age. However, that doesn’t mean they are going to. It can be up one year after they are actually able to do so. Here is the reason why that occurs. When it comes to the actual mating, only the lead male and female will actually do so. This is why it is often hard to get the number of wolves to increase. While a pack may have up to twenty members in it, only two of them are actually taking part in the mating process. There are studies out there though that show other members of large pack mating as well. It could be that it is allows when there is enough food and the pack is thriving. The exact conditions that have to be in place for that to be acceptable though isn’t fully understood yet. 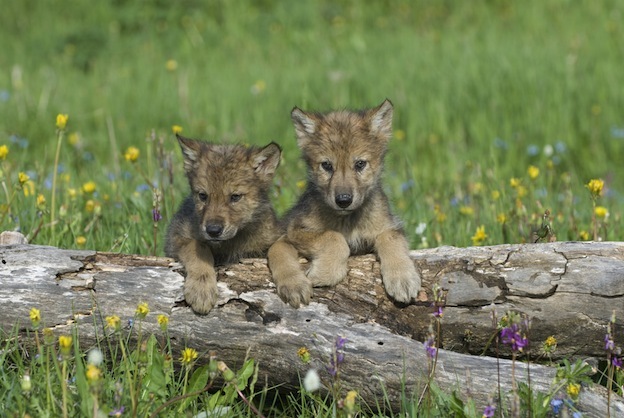 Research also shows that when there isn’t enough food or roaming area for a wolf pack that the alpha male and the beta female may not even mate at all. This is to ensure that those in their pack don’t have more to care for or more to share food with. As a result of this though it can be very hard to get numbers of species in danger of extinction to increase. The time of year when breeding occurs depends on the region where these animals live. It can be any time from January through March. The wolf makes once a year instead of twice. The females will carry the pups for about two months before giving birth. Generally she will have from four to six pups per litter. However, some have been noted to have up to fourteen of them at a time! She will give birth to the pups alone in her den. They are very small and vulnerable at birth. She will feed them milk from her body for the first month of life. It will be after the first month of life when they emerge from the den with her. Wolves seem to do very well when it comes to reproducing in captivity. Many programs out there are helping to structure this by keeping one male and one female together instead of a pack of wolves. Through such programs reintroduction of wolves into the wild has been a success with many different breeds. It is the responsibility of all the wolves in the pack to help to raise the offspring. They will take turns caring for them while other members go out to hunt. Making sure the young get plenty to eat is important if they are going to be able to thrive. Even with the entire pack caring for them, less than half of all pups survive the first year. If the mother had poor nutrition during the pregnancy they can be very small at birth. A lack of food for the entire pack to survive on can mean not enough is available for the pups. The pups in a wolf pack have a great deal of freedom and privileges. In fact, they are often able to do more and to benefit more than some of the adults within the pack that have a very low ranking. When they are about two years old they are mature, and then they have one of two things occur. They may stay within their own pack and be given a place on the social ladder. They can also leave that pack and go to form one of their own. Males often leave while females choose to stay in the pack they were born into.